Scientists at Duke University, UC Berkeley, Stanford, Yale and more than two-dozen other research institutions collaborated on this first large-scale investigation into the evolution of self-control, defined in the study as the ability to inhibit powerful but ultimately counter-productive behavior. They found that the species with the largest brain volume -- not volume relative to body size -- showed superior cognitive powers in a series of food-foraging experiments. Moreover, animals with the most varied diets showed the most self-restraint, according to the study published April 21 in the journal of the Proceedings of the National Academy of Sciences. 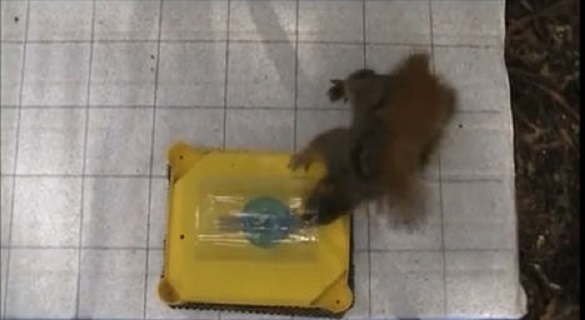 "The study levels the playing field on the question of animal intelligence," said UC Berkeley psychologist Lucia Jacobs, a co-author of this study and of its precursor, a 2012 paper in the journal, Animal Cognition. This latest study was led by evolutionary anthropologists Evan MacLean, Brian Hare and Charles Nunn of Duke University. The findings challenge prevailing assumptions that "relative" brain size is a more accurate predictor of intelligence than "absolute" brain size. One possibility, they posited, is that "as brains get larger, the total number of neurons increases and brains tend to become more modularized, perhaps facilitating the evolution of new cognitive networks." In one experiment, creatures large and small were tested to see if they would advance toward a clear cylinder visibly containing food -- showing a lack of self-restraint -- after they had been trained to access the food through a side opening in an opaque cylinder. Large-brained primates such as gorillas quickly navigated their way to the treat or "bait." Smaller-brained animals did so with mixed results. Jacobs and UC Berkeley doctoral student Mikel Delgado contributed the only rodent data in the study, putting some of the campus's fox squirrels and some Mongolian gerbils in their lab through food-foraging tasks. "About half of the squirrels and gerbils did well and inhibited the direct approach in more than seven out of 10 trials," Delgado said. "The rest didn't do so well." In a second test, three cups (A, B and C) were placed in a row on their sides so the animals could see which one contained food. It was usually cup A. The cups were then turned upside down so the "baited" cup could no longer be seen. If the squirrels touched the cup with the food three times in a row, they graduated to the next round. This time, the food was moved from cup A to cup C at the other end of the row. "The question was, would they approach cup A, where they had originally learned the food was placed, or could they update this learned response to get the food from a new location?" Delgado said. "The squirrels and gerbils tended to go to the original place they had been trained to get food, showing a failure to inhibit what they originally learned." "It might be that a squirrel's success in life is affected the same way as in people," Jacobs said. "By its ability to slow down and think a bit before it snatches at a reward."